In the world of sports betting, there are lies, damned lies and systems. You’re probably thinking: “Don’t you advocate betting systems in your articles all the time?” Actually, no! I have often said that the research trends and patterns uncovered in my pieces are tools to help you find value in your selections. To the best of my knowledge at least, I have never advocated a specific system and claimed it was a cure-all. First of all, different systems range from detailed analysis of form figures all the way through to idiotic ones relating to characters from a TV program. I visited one forum and discovered that a poster was trying out a system entitled Only Fools. It was an apt title since it involved choosing horses with names from the famed sitcom Only Fools and Horses. 1-10 runners in a race. Top 3 in the betting market. Top weight in the race. Has placed in at least one of its last three starts. Methodical betting systems are, in the main, the most frequently used and championed systems. However, the issue with them compared to other racing betting strategies is the lack of wiggle room. Rigidity is never going to give you a long-term profit. For instance, if you see a horse that meets almost every criterion above and looks likely to win, do you eliminate it from contention because there are 11 runners in the race? Some of the rules above make perfect sense. For instance, top-weighted horses have the highest ranking and probably have more class than lower weighted horses. It is a fact that top weighted horses win more often than horses second in the weight, who win more than horses ranked third in the weight, and so on. It also makes sense to look for horses with a recent place finish because a horse in some semblance of form is always better than one that has looked off the pace in recent times. When you create a betting system with a good structure and reasons for including every rule, you’re likely to pick a couple of decent-priced winners a week. If you persist in creating a rigid system, you could miss out on a few great winners that would make all the difference to your bottom line. For instance, your system may say that the horse needs to have previously won at today’s distance or going. Now let’s say your system specifically says qualifying contenders must have won over 6 furlongs at Bath racecourse. However, the 6f races at Bath actually take place over 5f 161 yards so by the rigid confines of your system, the horse you’re considering is now a non-contender. You face the same issue if your horse needs to win over 5f at Bath. The shortest race at Bath is 5f 11 yards. While this may be an extreme example, it serves to highlight the foolishness of blindly following systems. 1-7 days since last win. Last win was in a Class 4 race. If you followed this particular system since the beginning of 2012, you would have an ROI of 21% on Betfair. On the surface, it seems like a fantastic system but there is something that quite a lot of people do: Overfit Their System! In betting, overfitting means that your system can only find profitable selections based on the data samples used to create the system. It normally happens when a system has rules that don’t make sense in relation to the race condition or the runners. It also happens when you make the system too complex by adding lots of rules. The system involves making 1262 bets with an average of around 200 a year. If you miss a few of the 167 winners there have been in total, it throws the entire system out of whack. Also, how does the system perform on an annual basis? As you can see, the system in question is very good having provided profit in six of the last seven years. But look at the average win percentage. Only 13.23% of your bets will win which means you can expect to go on some pretty brutal losing streaks. For reference, at a 10%-win rate, your maximum likely losing streak is 37 over a sample of 500 bets (it could be higher). Once you get to 1000, the possible losing streak increases to a wallet-crippling 66! Meanwhile, your maximum winning streak is just three. At a 15%-win rate, you have a 295/1 chance of winning three bets in a row. In contrast, you have a 4/1 chance of losing 10 in a row. How big is your betting bank? Can it survive dozens of consecutive losses? The answer is likely to be NO! It is also crucial that you don’t fall prey to the gambler’s fallacy. This term relates to the myth which suggests that an event which didn’t happen recently is overdue and more likely to happen. For instance, if you have lost 22 bets in a row using your 13%-win rate system (where you might have expected 2-3 wins), you are NOT more likely to win the next bet. Why? Because statistically, it is possible for you to lose another 40 in a row. Also, a bad bet is a bad bet and no amount of statistical analysis will help a donkey turn into Frankel. There is absolutely nothing wrong with creating a system as a means of narrowing down your potential bets for the day. A well-designed system can save you a lot of time and effort by reducing the number of races you’re forced to analyze. However, once you have narrowed down the contenders according to your system’s criteria, it is time to look more closely at the horse, the race, and the level of opposition. Also, don’t be afraid to deviate from the system slightly. 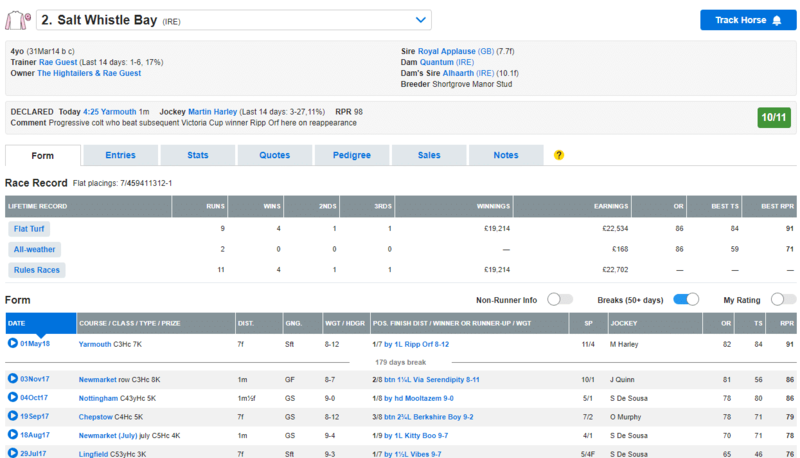 Take this Class 4 flat race at Yarmouth as an example. Salt Whistle Bay is the most recent race winner in the event but it came in a Class 3 event. Before that, he won a Class 4 event. Alas, today’s race is over 1m 3y. Therefore, even though he is the clear favourite and likely to win in this Class 4 race, is aged 4 and has a Class 4 win to his name, because the race is a bit long and his last win was a Class 3, a rigid system would discount him. Given the gap in quality between Salt Whistle Bay and the rest of the field, do you back him anyway? If you did, you would have lost as the favourite was beaten by a short head.